While it's true that only the person who changes the bed will see whether or not it is stained, ignoring the stain won't make it go away. You can learn how to clean mattress stains using either commercial products or things you probably have in your kitchen. After any stain removal, place a dryer sheet on the area before covering it with the bottom sheet to neutralize any odors and keep it smelling fresh. Here are some techniques for messes of various types. For stains of an unknown nature, spray a citrus based product on the soiled area and let it stand for approximately five minutes to penetrate the stain. Using a white absorbent cloth, blot the area, pressing down firmly without rubbing for 30 seconds. Repeat this blotting process until the area is dry and odor free. As an alternative, you can use a mild dish detergent for spot treatment. Blot the stain with the detergent and wipe it thoroughly with a damp sponge. In addition to the risk of starting a fire, the problem with smoking in bed is that cigarette odors can penetrate absorbent materials deeper than the surface area that can effectively be reclaimed. If you're not ready to replace your bedding, you need to find out how to remove this smell. Working in sections, use the citrus technique specified above. Repeat the washing and blotting process in each section until the whole thing is dry and odor free. Baking soda is another option. Sprinkle the whole top with baking soda and leave it there overnight to absorb and neutralize the odors. In the morning, vacuum the powder off. Removing mold and mildew is a difficult, especially if they have penetrated deep inside the mattress. Use the same citrus techniques indicated above. Since mold and mildew are caused by moisture, it might be beneficial to run a dehumidifier, heater or air conditioner in the room periodically to take the dampness out of the air. Another alternative for how to clean your bedroom set marks caused by mold and mildew is to take the box spring and top outside on a sunny day. Sweep off all visible mold and mildew and then vacuum with a heavy duty vacuum. Allow the sun to shine on them for several hours. This will dry and freshen it. Accidents happen. When the accident involves pets or small children it is more than just embarrassing. Urine can saturate absorbent materials well beyond the surface area. Extracting urine from a bedding is hard if it has penetrated deep into the cloth materials. 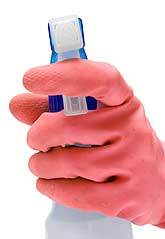 This creates ideal conditions for bacteria and mold growth and the related unpleasant odors. It may be possible to rescue your mattress. First blot up as much of the urine as possible with an absorbent cloth. Then spray a product like PAWS - Pet Accident Washup Solution or Bio-OX Citrus Concentrate or any other brand that mentions urine odor removal on its label on the soiled area. Follow up with the blotting and drying techniques indicated above. Vinegar will also remove urine stains. Saturate the stain with vinegar and blot until no more of the urine can be removed. Cover the area with baking soda to neutralize the odor, leaving it on overnight. In the morning, vacuum the powder off. Kids, brightly colored beverages and beds don't mix. Even the most careful child will have spill something eventually if they drink in bed. Porous materials and fabric will soak up these liquids. It is impossible to remove the entire liquid spill from the inside. The dyes in Kool-Aid generally leave a permanent stain, but you can try to remove the surface stain. First, blot up as much of the liquid as possible with an absorbent white cloth. Use the citrus cleaner techniques shown above. You might also try spraying vinegar onto the stain and letting it sit for about an hour. To remove as much liquid as possible, cover it with a thick cloth and weigh the cloth down with a heavy book or brick. After the hour is up, spray the stain with vinegar again and blot it with a cloth to lift the color. Repeat the process until the stain is completely removed or no further reductions of stain color occur.